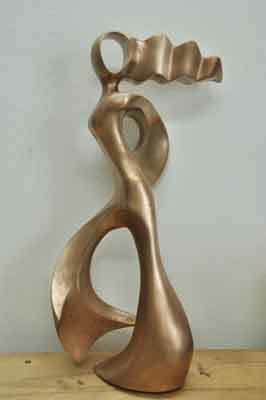 Having your work cast in bronze is a very special experience, as you will be producing a work of art that will potentially last forever. 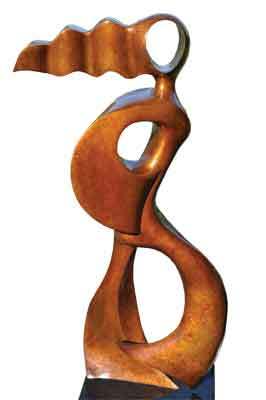 Also, the medium of bronze is so completely different to wood - the way the light and shadows strike across the surfaces, corners and undulations - bringing a completely different life and feel to the sculpture. 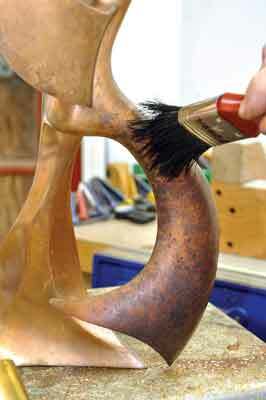 In this article, I am going to show you the two procedures -Â chasing and patination - that have to be undertaken directly after the bronze has been 'fettle finished'. This refers to the condition of the surface of the material after the sculpture has been cast, the ceramic shell and core bearing from the hollow bronze removed, and the runners cut off. 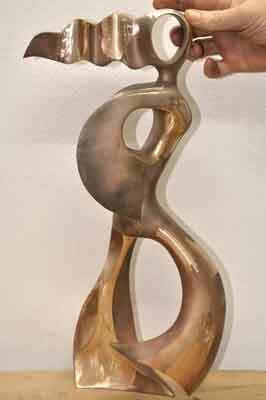 This is the condition of my work when I receive it back from the foundry - I like to do all of the finishing to my high standard and put my own stamp on it through patination. 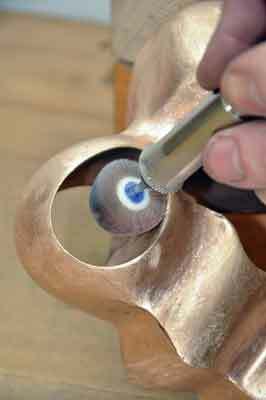 The first procedure is called the 'chasing' which is a jewellery term and consists of several stepsÂ that progressively refine the sculpture, until the desired surface texture and shape have been achieved. 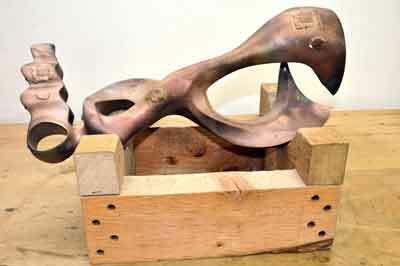 Gallery image 1 shows the original wooden sculpture, its mould and the fettle finished bronze, ready for chasing. 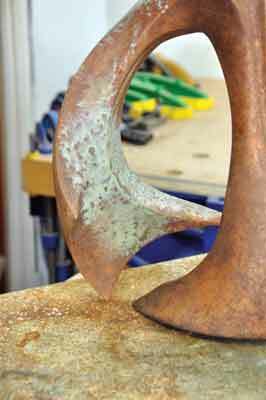 As you can see, the surface of the bronze has square weld marks which is where the 'core bearing' - ceramic material - was removed from the hollow bronze after it had cooled. The other small, circular blobs are the remains of the 'runners' that transported the liquid metal into the ceramic mould when it was poured. 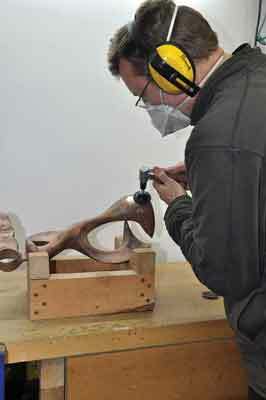 The bronze is placed in a special wooden cradle, which supports the sculpture and is ready to be worked upon - see gallery photo 2. 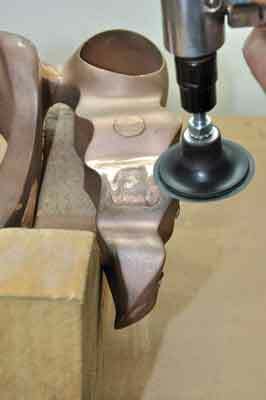 I use an air compressor and die grinder with quick change 80 grit discs to carefully remove the welding material evenly down onto the surface of the bronze - see gallery photos 3-4. 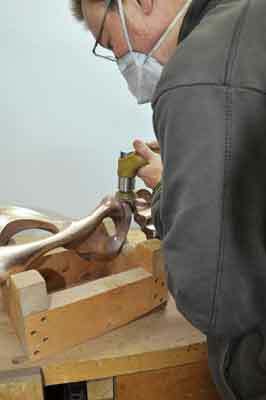 The procedure of removing the welding material is repeated all over the bronze - see gallery photo 5. 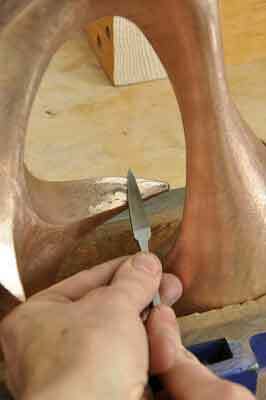 In some areas, the die grinder is too big to access the contours of the sculpture, so various hand files are used to cut the surface back smoothly - see gallery photo 6. Once all of the welds and runner marks have been smoothed evenly back to the surface, the sculpture is ready for sanding - see gallery photo 7. I use a dual action orbital sander and work over the complete surface with grits 80, 120 and 180 - see gallery photo 8 - but have to hand sand any awkward areas where the sander cannot access. I use a flap wheel on my flexi shaft machine to access the awkward areas inside the head - see gallery photo 9 - and the inner circle of the arms - see gallery photo 10. The surface has now been sanded through all grits and is fully prepared for the chemical patination - see gallery photo 11. 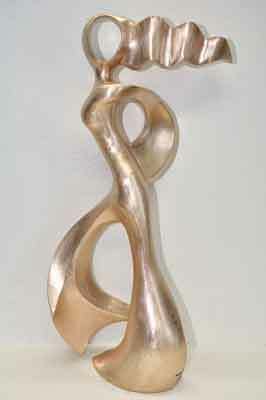 As you can see in gallery photo 11, the natural colour of bronze is virtually identical to brass and if desired, can be brought to a perfectly polished surface such as we see on many sculptures - Brancusi's Bird being one of them. There are many other chemicals in addition to the three main listed, that are used and mixed to give a wonderful range of different effects and colours. 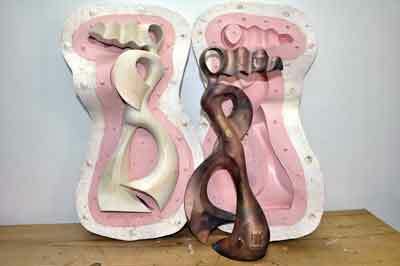 In fact, each foundry and patineur develops their own carefully guarded blend of chemicals and techniques for different effects, so it really is an art unto itself! 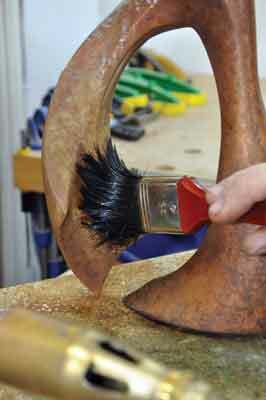 There are many ways of applying the chemicals to the bronze, for example: immersion colouring, vapour technique, and sawdust technique, to mention just a few, but I am going to demonstrate how to use the torch technique in this article. 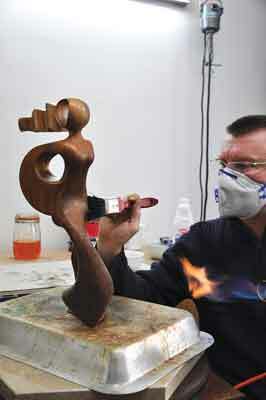 The first chemical that is applied to the bronze is a very weak base coat of potassium sulphide. 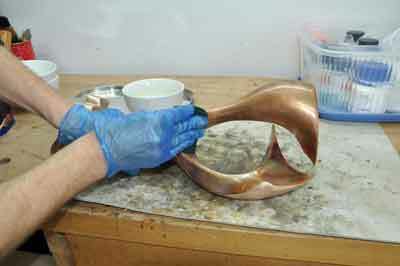 This is applied cold and scrubbed onto the surface of the bronze with a green Scotch-Brite pad - see gallery photo 12 - and left for a while to react with the metal before being scrubbed again under running water. 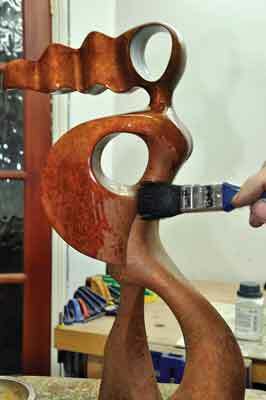 This chemical adds depth to the patina and gives a good base from which to build up the other colours onto - see gallery photo 13. 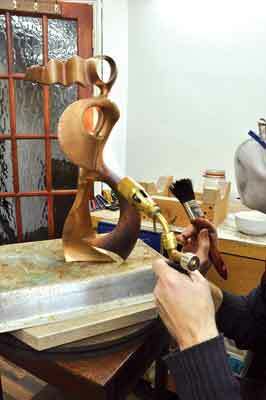 With the bronze scrubbed under running water, it is now ready for the next stage - see gallery photo 14. 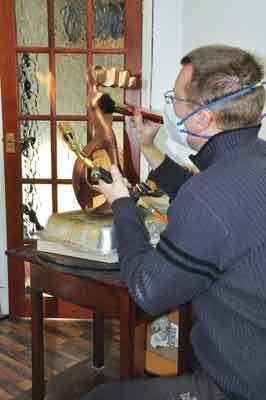 I use a roofers' torch with propane gas to evenly heat the surface of the bronze to a temperature just hot enough, so that the liquid chemical hisses when it is applied - see gallery photo 15. I now start to apply a weak solution of ferric nitrate - this is stippled onto the surface with a brush, building up the colour evenly over the entire surface of the sculpture - see gallery photo 16. 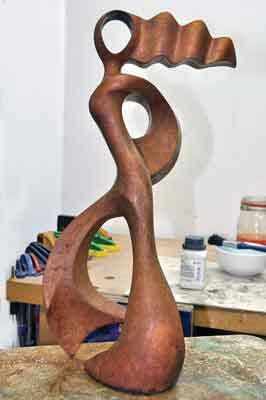 The heating and stippling process is repeated, and the sculpture starts to take on the golden and reddish tones of colour - see gallery photo 17. I have now made the ferric nitrate solution slightly stronger and am building up a deeper redder colour on the lower part of the sculpture, blending up to a more golden upper section - see the main photo opposite. 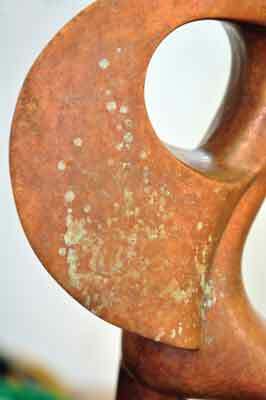 I now add some copper nitrate to a few areas on the sculpture, and then go back over these areas with the ferric nitrate, which produces a distressed effect and a more orange colour - see gallery photos 18-20. 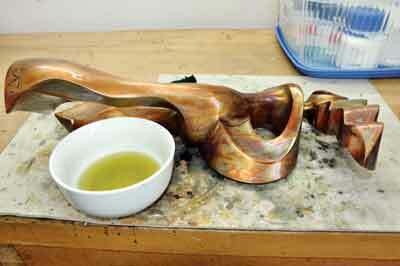 The patination is now completed and is ready for the application of wax polish - see gallery photo 21. The effect of the polish on the bronze is incredible - all of the subtle markings and colourings really jump out and become rich and enhanced with amazing depth. The skill and understanding of a good patination only comes with experience, as it is hard to fully comprehend what the outcome of the colour will be until the wax is applied. 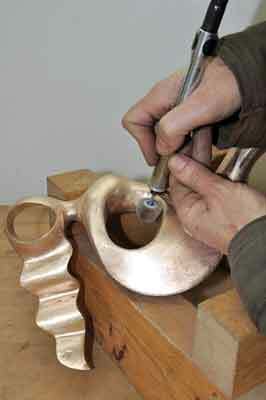 I use clear Briwax on my bronzes, applied with a brush whilst the sculpture is at a medium temperature - see gallery photo 22. You can now clearly see the varying tones of red over the surface, plus the stippled effect of the brush, and also the distressed effect of the ferric on top of the copper nitrate on the leg, etc. - see gallery photo 23. 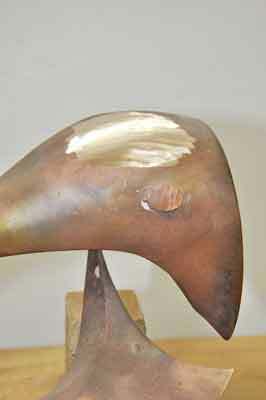 The bronze is now left to cool completely before it is buffed with a soft polishing cloth. It then has another application of wax, applied cold, and buffed up again to produce a wonderful shine on its beautiful coloured surface. The chemicals used for patination are not widely available for purchase and can be a bit tricky to secure, but Andrew has found a company who will supply if you explain what you will be using it for i.e. to patinate your woodcarvings.